The 1 oz. RCM gold bar is one of the most popular products for investors who want to maximize their investment in hard metals. 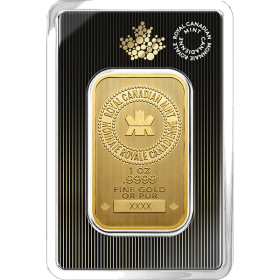 Produced by the Royal Canadian Mint, this high-quality gold bar is trusted by investors the world over. When someone wants the assurance and quality of gold bullion from a trusted world mint without having to pay the higher premiums over spot associated with buying legal-tender bullion coins, this RCM gold bar fits the bill. Many types of gold bars are not eligible for inclusion in an individual retirement account (IRA). However, RCM bars – like Canadian Maple Leafs and other coin products – are IRA eligible. Their low premium over spot therefore makes RCM bars one of the most affordable options for investing in IRA-approved gold products. Of course, one of the big advantages of buying IRA-approved gold is that you can invest in precious metals while still enjoying the many tax benefits that come when you invest in your IRA. RCM Bars Contain Virtually Pure Gold – Each 1 Oz. RCM gold bar is 99.99 percent pure – that’s four 9s! Global reputation – RCM gold bars have the backing of the Canadian government and are widely trusted by investors. Counterfeit Protected – In 2016, the RCM instituted visible, anti-counterfeiting technology on its 1 oz. gold bars, including micro-engraving marks. Easily Identifiable – The weight, purity, and serial number are stamped on the obverse and a repeating maple leaf pattern is on the reverse. Highly Liquid – RCM 1 ounce gold bars are stamped with their distinctive design, so they are instantly recognizable. Tangible Wealth – Nothing compares to the sensation of gold in your hand – it’s real, solid wealth you can hold in the palm of your hand. There are millions of bullion bars in the investment market, but few compare to the quality of the gold bars we sell at Universal Coin & Bullion. We ensure that every gold bar we offer has a minimum of nicks, scratches, and other imperfections that may lessen the actual gold content of your bar. Universal Coin & Bullion is privileged to have Dr. Michael Fuljenz (a.k.a. “America’s Gold Expert”) on hand to inspect the gold bars that come into our inventory. Dr. Fuljenz, who has appeared on Fox Business News, Bloomberg TV, and CNBC, knows what a quality gold bar looks like, and needless to say he believes any gold bar with heavy gouges, cuts, and other forms of damage is simply unacceptable. When you buy an RCM gold bar from Universal Coin & Bullion, you can rest assured it will be one of the highest quality bars available anywhere. And that’s not all. Online orders greater than $99 qualify for free shipping, helping you to maximize your investment dollars. We ship our products in discreet, secure packaging, and will not consider your order complete until you’re completely happy with the products you’ve received from us. You can always count on our team of dedicated customer care associates who are standing by. They’re ready to assist if you need any help with your order. We proudly maintain an A+ rating with the Better Business Bureau. 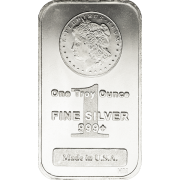 Call Universal Coin & Bullion toll-free at 800.822.4653 to order your RCM 1 oz. gold bars. Hurry, prices are on the move!